Lower cholesterol is not just a concern of grown ups, or at least it shouldn’t be. More kids and teens are being diagnosed with high cholesterol and need to lower it as much or maybe even more than their adult counterparts. The number one reason for the need for kids and teens to lower cholesterol is obesity, which is running rampant in today’s younger set. A low cholesterol diet and one low in saturated fat is equally important for kids as it is for health conscious adults. It is true that infants and toddlers under the age of 2 need extra fat for growing organs, but that need levels off after the age of 2. The wide spread consumption of fast food and soda are great contributors to childhood obesity. This in conjunction with more video games and web surfing among kids than running and bike riding compounds the problem. Research conducted by the Children’s Nutrition Research Center at Baylor College of Medicine in Houston tracked 1,182 third graders for two years. It concluded that serum lipids and fatty substances in the blood resulting from diet were comparable in both children and adults. The impact of total fat and saturated fat consumption as it relates to cholesterol levels was also the same in children and adults. The problem with childhood testing is that it doesn’t usually look at cholesterol levels. There are children as young as 6 who would benefit from such testing so that treatment could begin earlier. The negative effects of children and teens with high cholesterol are not usually realized until they reach adulthood. So children with family histories of high cholesterol or who are obese should be tested frequently so that dietary changes can begin immediately. A plan that can keep the whole family healthy is to eat a low fat and low cholesterol diet. 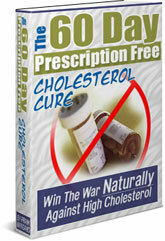 Details can be found in The 60 Day Prescription Free Cholesterol Cure.